← Banana Bread We Will Love! 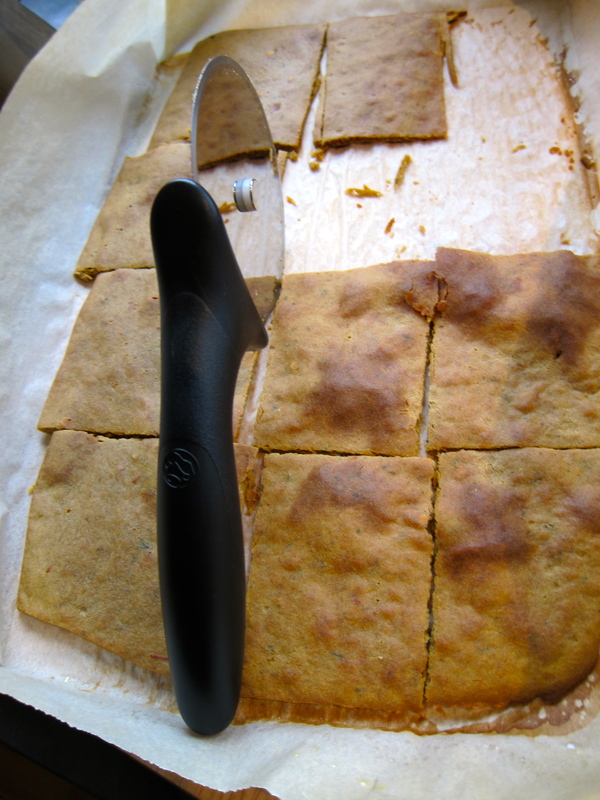 Socca – Chickpea flatbread from Shorty! If you’re like me, you love to try new things. It isn’t everyday that you hear about a new food you’ve never eaten before. It helps when you trust the taste buds of the person offering the recipe. It helps when the ingredient list is so miniscule that you only have to shop for a single item. It helps when you know that the recipe is as healthy as it is tasty. Shorty is a gourmet chef, she knows food. Mix together the water and oil. Add salt, pepper, cumin, coriander, thyme and chilis to the flour. Stir the water-oil mixture into the seasoned flour and whisk until you have a smooth batter. Leave it to rest at room temperature for at least one hour up to 24 hours to allow the flour to absorb the water. Line a baking pan with parchment and build corners with the parchment paper creating a box shape which is about 12 x 8 inches, with sides to retain the batter. Fold the paper to create the rectangle and then staple the corners so they hold their shape. You want the batter to be about ¼ inch thick. Preheat oven to 450. Brush the paper generously with olive oil. Pour in the chickpea batter and bake for 25-30 minutes, until golden brown and crisp. Remove from oven and leave it to cool for one minute. Remove it from the pan and brush lightly with olive and grind some pepper. Slice and serve hot. You can vary the seasoning and the toppings. 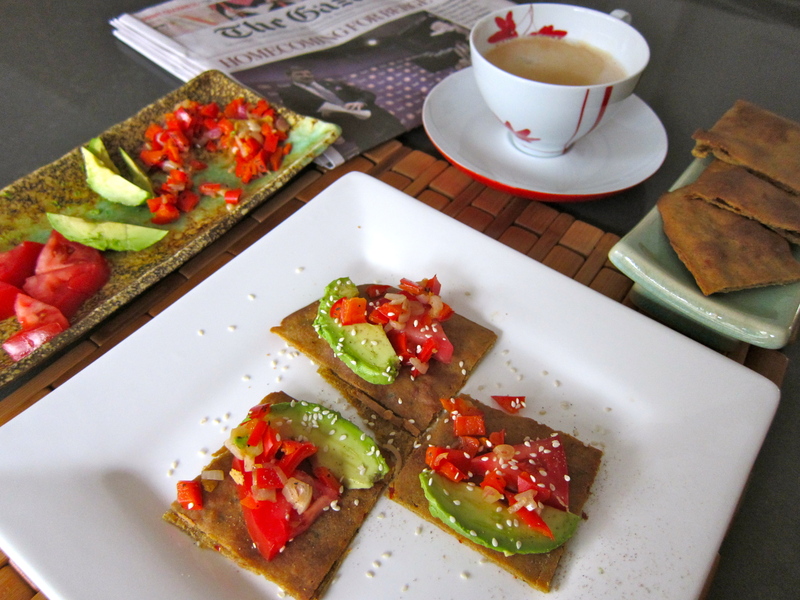 I added tomato, avocado, finely diced roasted red pepper and scallion. Any fresh herbs will be delicious. Cut into small squares and use with different toppings and paired seasonings. A big thank you to my delightful friend, MaryAnn Harrison, aka Shorty, for sending in this wonderful recipe! Kacey Rose Baines is the lucky winner of Jittery Cook‘s Blueberry Gin. Thanks so much to everyone who participated in the draw. We all win by sharing your wonderful recipes! The Kitchn, David Leibovitz, pure 2 raw, Cook For Good. Reheat socca for up to a week by toasting lightly. Flavours seemed to come out even more the second day. Tastes great with just 2% Oikos yogourt. It is gluten-free and vegan. Check out the newest feature slowly being added to every Jittery Cook post–Print Ready Recipes. Finally you can print each recipe on a page or two. Look for the links just above each “Final notes“. 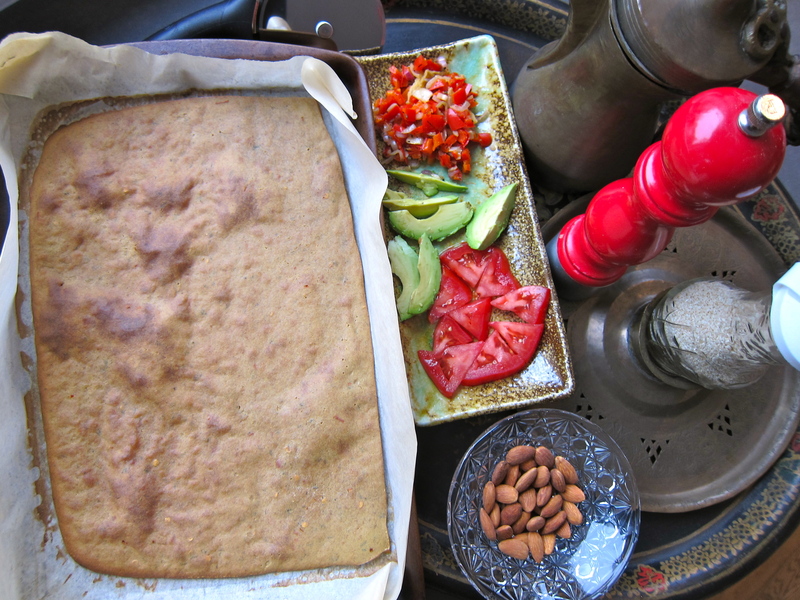 Thank you to my super-compatible coworker and friend, Susie Martin, for steering me to the Iranian Marché Alborz (6685 Rue St-Jacques, Montreal, 514-692-2049), where I picked up the one socca ingredient not already in my cupboards. 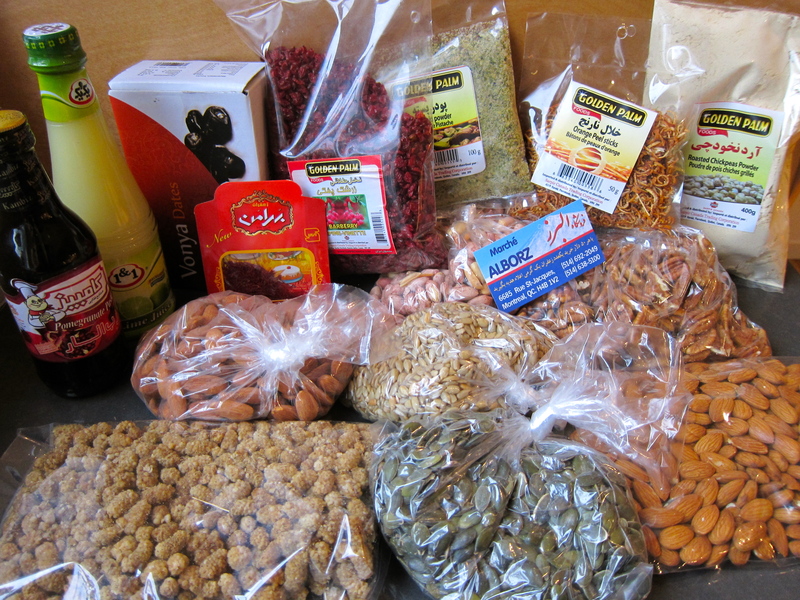 Go there for wholesale priced, top quality, preservative-free foods and the freshest nuts in town. This is what I managed to come home with while shopping for chickpea flour. Roasted Cauliflower and Broccoli Soup – with no after-effects! Cheesecake to Celebrate Mother’s Day! Banana Bread We Will Love! Robert Bowden is the winner. Thank you to everyone who contributed recipes. Keep 'em coming! New draw starts now!